This article by Sadhbh Walshe is re-posted from The Guardian via GRIID. Editor’s Note: The Michigan Department of Civil Rights published a report on the working and living conditions of migrant workers in Michigan. The report acknowledges that working conditions are as bad and in some cases worse now than they were for migrant workers in the early 1960s. While we don’t yet know how this will allplay out, at least there will be a path. For one group of immigrants, however – the farm workers who sustain our food supply – there is reason to fear that what awaits them is not a path to citizenship, but their cemented status as indentured servants. When you consider what these jobs entail – hours of backbreaking work in terrible and often dangerous conditions, subsistence wages with little or no time off, and none of the protections or perks that most of us enjoy (like paid sick days, for instance) – it’s hard to see why anyone with other options would subject themselves to a life that is barely astep above slavery. Most employers would be delighted to get away with all this: being able to hire low-wage workers at will, without the hassle of paying disability insurance or other niceties. But agribusinesses find the guest-worker program’s pitiful protections such a burden that they have mounted a relentless campaign to undermine them, and for the most part, work around them anyway; they hire undocumented workers instead. 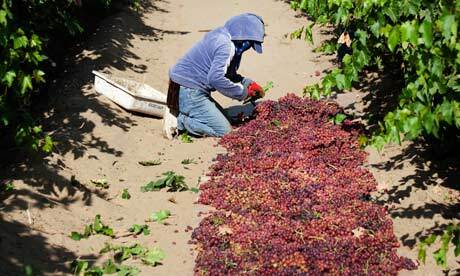 It’s agriculture‘s worst kept secret that farm owners routinely break the law by hiring undocumented workers, but the crime receives tacit approval from lawmakers sympathetic to the plight of major agribusinesses, which seem to consider cheap labor their right. In South Carolina, for instance, lawmakers passed their version of Arizona’s draconian bill, and have mandated that employers use an e-verify system to check the immigration status of employees. Farm workers, however, were exempted from verification. Several studies have been conducted, however, that expose these hollow threats for the nonsense that they are. A report by the Congressional Research Service (pdf)found no evidence of a labor shortage in the agricultural sector. On the contrary, it found that between 1994 and 2008, the unemployment rate for farm workers was consistently higher than for all other occupations. In other words, agriculture has had a surplus of available workers for decades. During this period, the agricultural industry has recorded a nearly 80% average annual increase in profits – more than all other major industries. No doubt, these record profits have something to do with the fact that real wages for farm workers have remained stagnant throughout this time. Finally, a 2011 report by the Economic Policy Institute found that an increase in farm workers’ wages of 40% would result in an annual rise in household spending by the American consumer of just $16. Clearly, the economic argument for allowing one industry a workforce of virtually indentured labor does not hold water. But there is a humanitarian argument to be made, as well, that should be enough to put an end to this exploitative practice immediately. In 2009, the New York Times’ Bob Herbert wrote an article about the horrible treatment of farm workers in upstate New York – in this case, hired to feed and care for ducks farmed to be slaughtered for foie gras. “The routine is brutal and not very sanitary. Each feeding takes about four hours and once the birds are assigned a feeder, no one else can be substituted during the 22 day force feeding period that leads up to the slaughter … Not only do the feeders get no days off during that long stretch, and no overtime for any of the long hours, but they get very little time even to sleep each day. The feeding schedule for the ducks must be rigidly observed. Herbert went on to make the point that we are much more likely to hear complaints about cruelty to ducks by force-feeding than we are about the cruelty to the people hired to feed them. Consumers have long since showed a willingness to pay more for organic meat or chicken because they don’t like the idea of animal cruelty. It remains to be seen what the bipartisan “gang of eight” senators have in mind specifically for farm workers in any future immigration bill. But one can only hope that they will not give in to bullying by the spoiled agricultural industry, which continues to deny these workers the same rights and protections every other worker in America enjoys.